Have you ever heard of the “Labskaus”? Yes? Then you´d probably wrinkled your nose over this awkward pink colour of the dish – which is one of the most common aversions of people who don´t know about the delicious character of this delicacy. Second prejudice: “There´s mashed fish inside”. Nope, it´s definitely not. Labskaus in reality is a very tasty, rich flavored and yet simple dish, eaten by generations of seafarers of the past and a Hamburgian classic. Here´s how you make it. Labskaus was the star of its time because it is made of mostly non-perishable, simple and comparatively cheap contents – yet at the same time rich of nutrients and tasty. Remember: The ship´s cook was the second most valuable person onboard a sailing vessel. 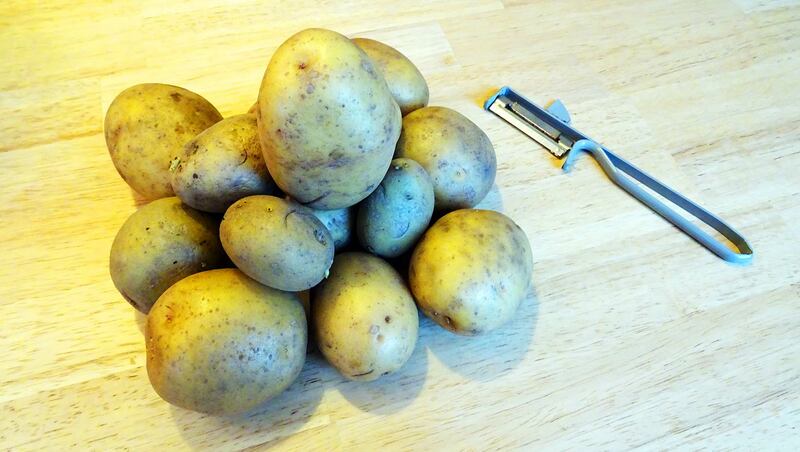 Here´s what you should have at hand to prepare a Labskaus: Potatoes. Onions. Beetroot. Pickled cucumbers. Corned Beef. Eggs. 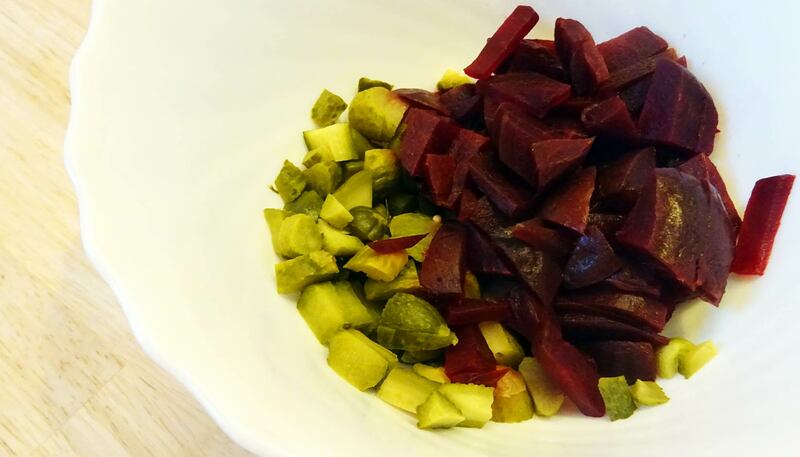 Whilst the potatoes are cooking, you will fry – nicely minced – onions, pickles, one third of cooked beetroot and Corned Beef in a pan. Have it fried nicely and pour some of the leftover water from the pickled cucumbers into the pan. When the whole mashup turns pink from the beetroot, it´s basically done. When the potatoes are done, have them mashed roughly and not too much and fold in the fried contents. The mashed potatoes should now receive the same pink colour of the fried stuff. Still steaming hot, you might taste the dish with pepper (no salt needed, because of the Corned Beef). That´s basically it. Here in my home town of Hamburg, Labskaus will be served in basically every German-food restaurant. And each of them will have their own “special” recipe. I´ve eaten Labskaus in many, many varieties, but here´s my favourite: Instead of two filets of Pickled Herrings (called “Matjes”) I like the smaller herring-snacks you can buy in every supermarket. Traditionally, Labskaus is also served with a fried egg, sunny side up. 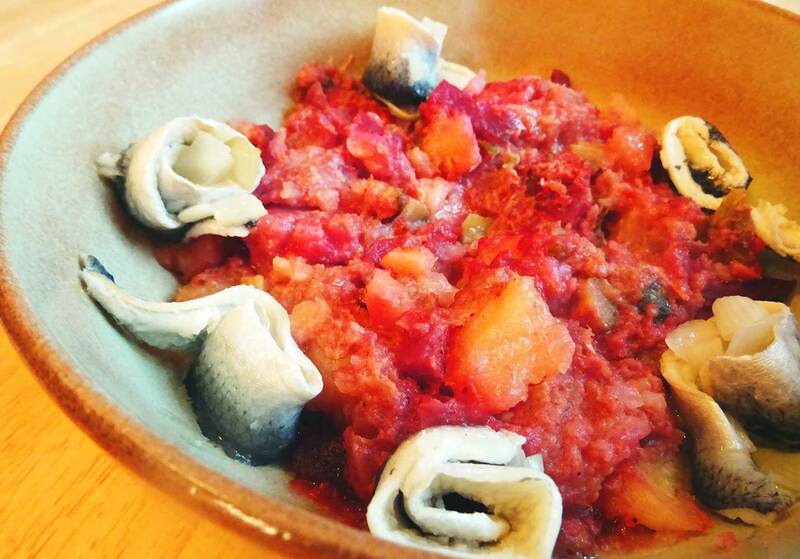 Herring or Matjes Filets – perfect & tasty. True Cult! You might add fresh herbs and it tastes fine, but that´s a luxury they didn´t have had back on board the wooden hulks hauling goods over the vast oceans. I love Labskaus because it´s a dish full of flavour, I love the rich colours. I love to tell stories to my children when we occasionally eat it. It´s a classic and a part of Hamburg´s culture.